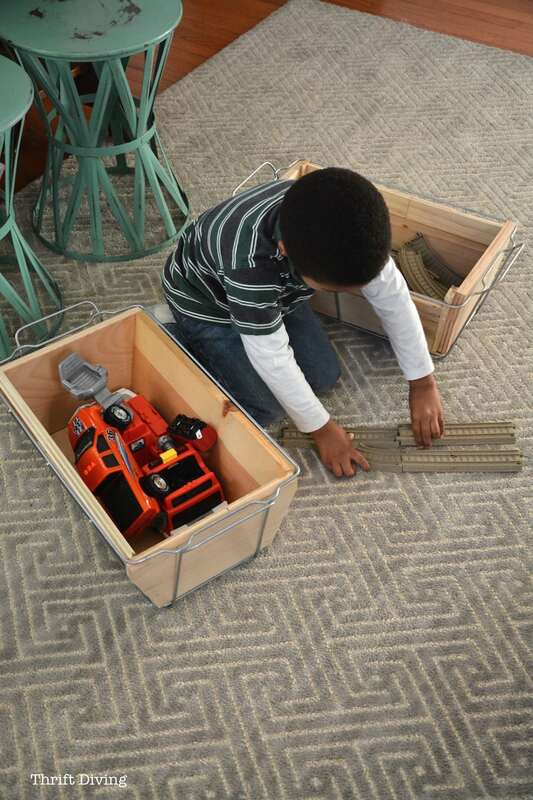 Click here to pin this project for later! 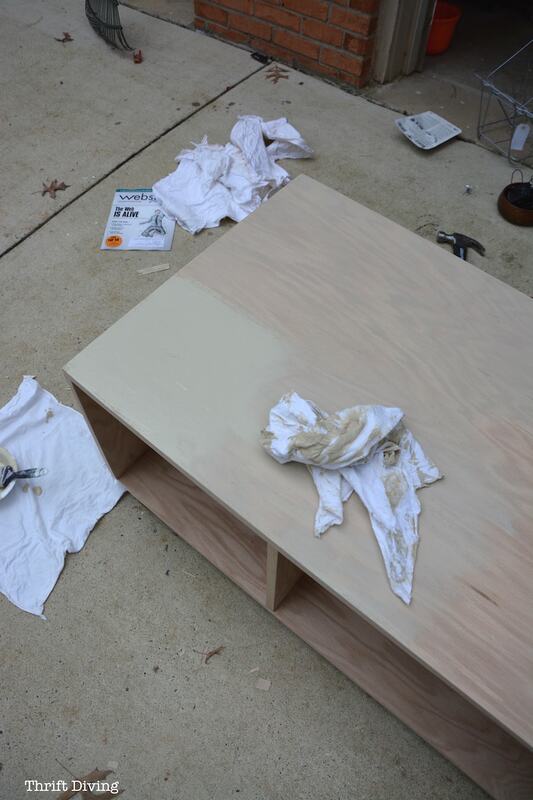 As much as I love me some thrift stores, I love building stuff from scratch. Even better, I love building stuff and then tossing in some repurposed stuff from the thrift store to make it even more unique. That’s what I did for today’s project. First, it all started with this big ‘ole hunk a’ wood. 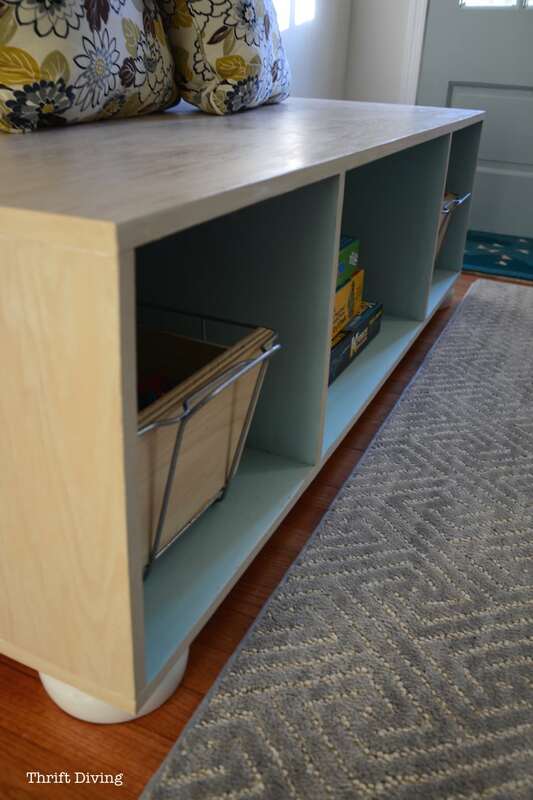 I started off wanting to make a coffee table or something with storage for my cozy family room that I just made over. Let me start off by saying, don’t let this post intimidate you!! As much as I love power tools, I have never built something this big. I usually build smaller crafts projects, like this DIY tablet holder that you can hang on your wall. I was just going to wing it and see what I could come up with (how’s that for planning?? HA!). 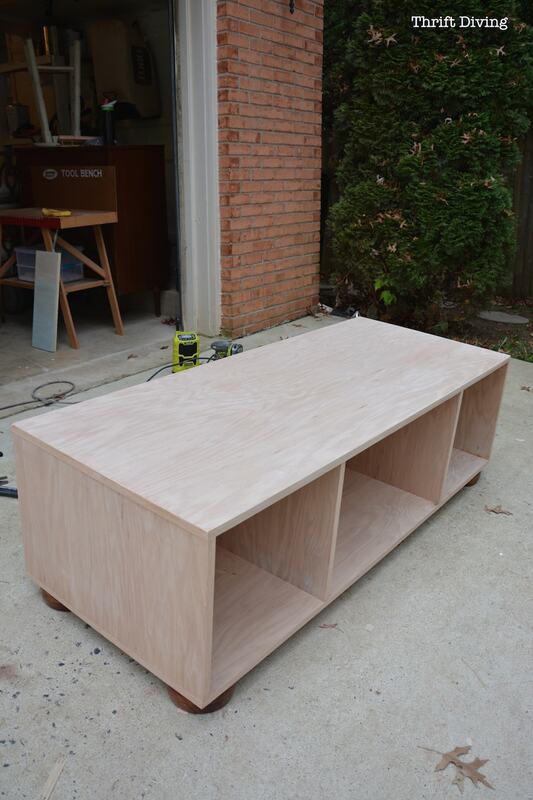 When I build things, I usually choose birch plywood, but this time I chose oak because I loved the big grainy texture and wanted to keep the look of the wood. More on that in a bit. I also used wooden bowls from the thrift store for bun feet! I bought them months and months ago and knew I’d use them for faux bun feet, and this was the perfect project to do it. Have you seen the price of real bun feet?? At $11 a pop, you’re spending $40 on feet alone!!!! 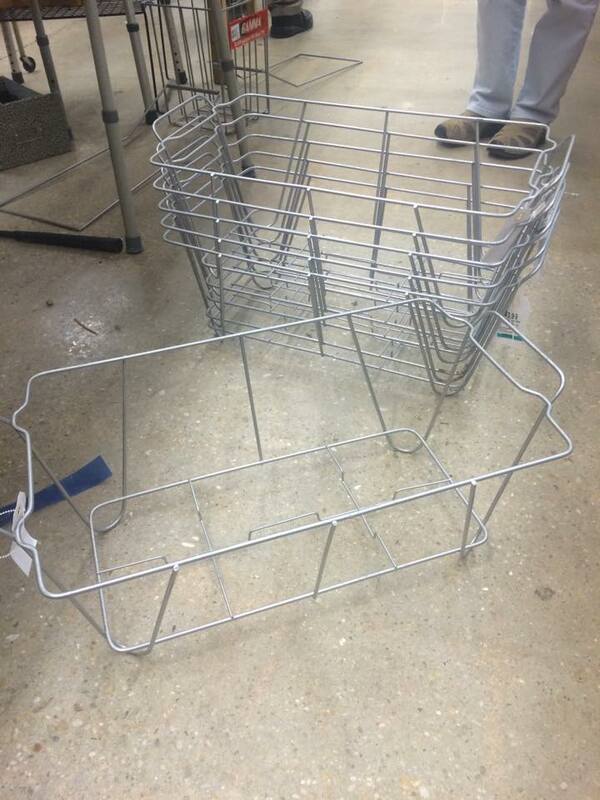 I also wanted baskets for the inside, but again, baskets are expensive, and I knew I’d need 2-4. I had found these buffet warmers a whole year ago and someone on Facebook gave me the awesome idea to line the inside with wood, so I lined them with scrap wood I had lying around my garage and glued the pieces together with Elmer’s wood glue! 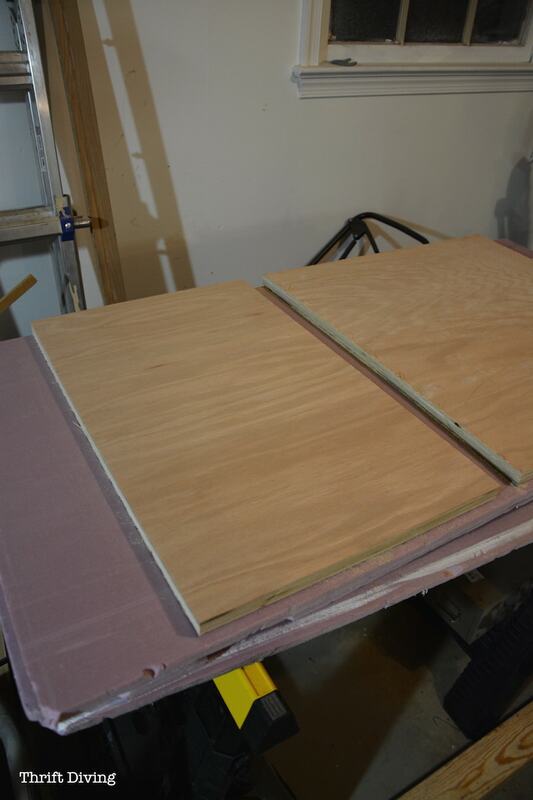 1 sheet of oak plywood (I used Purebond) 3/4″ thick. Have them cut it length-wise in half for you, like this. 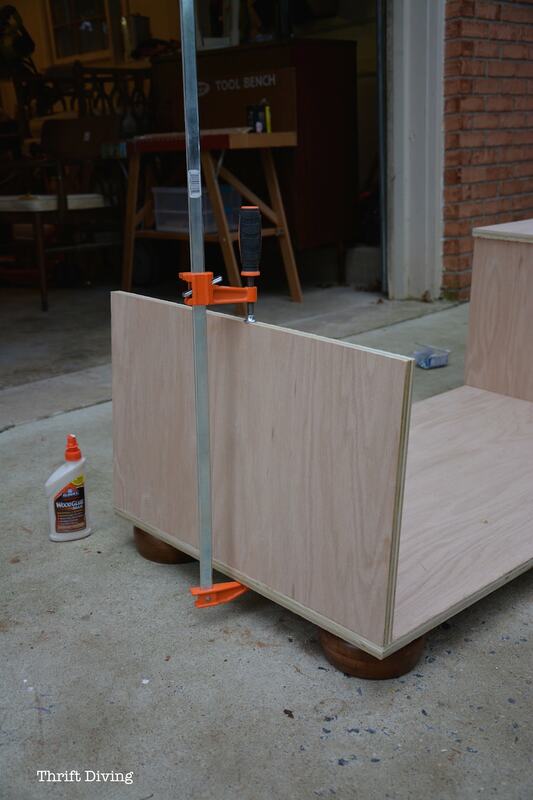 Have Home Depot or Lowe’s cut your sheet of oak plywood length-wise. 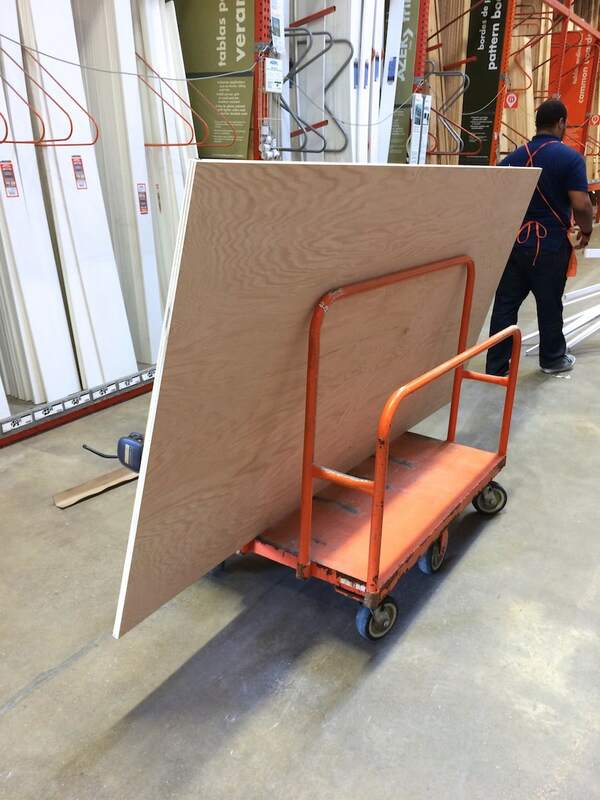 It comes in a 4’x8′ sheet, and there’s no way that thing is fitting in my van! 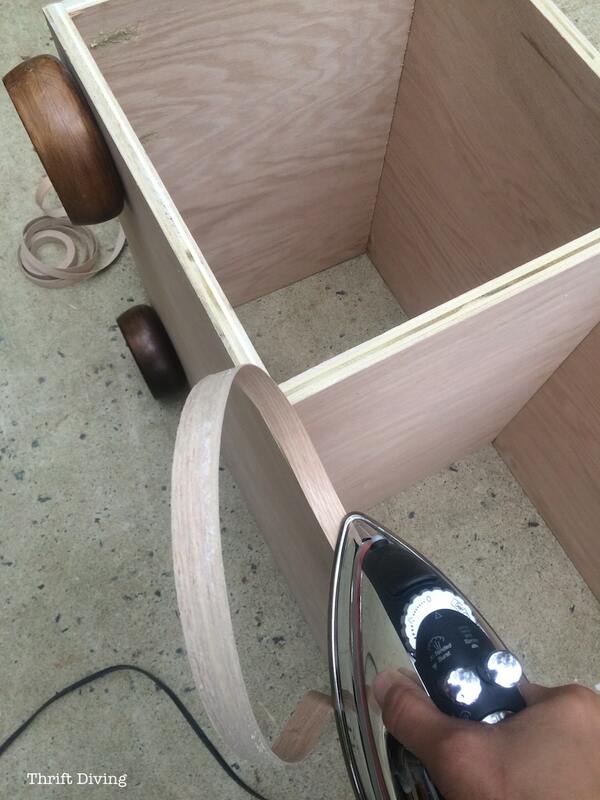 The coolest thing is that if you know your measurements, you can get your wood cut close to size. 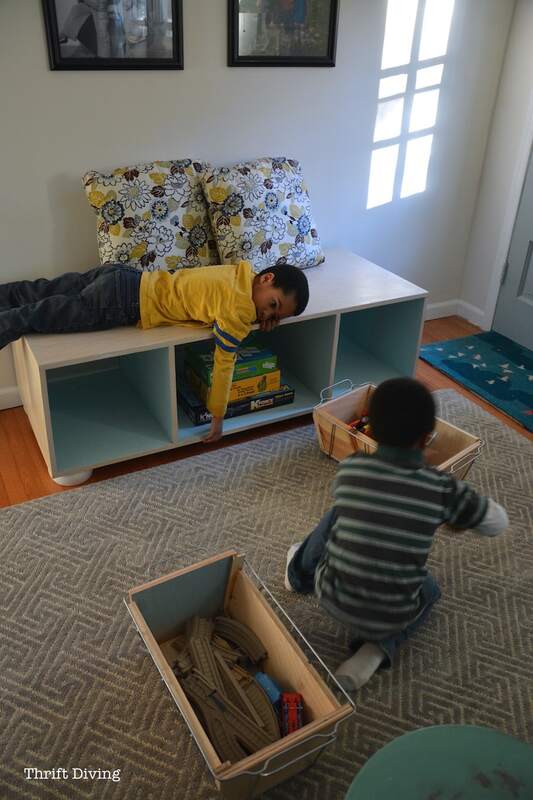 If they measure properly, you can just assemble it when you get home! 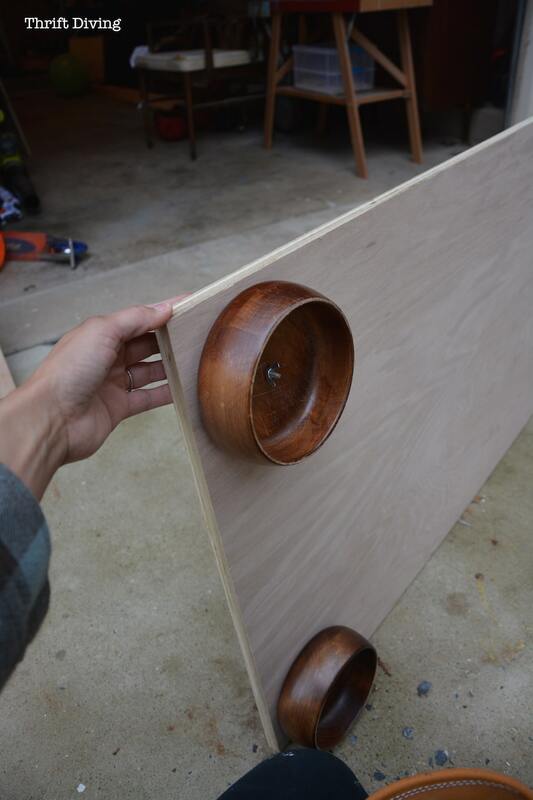 With the bowl feet attached, the bench measures 18 5/8″ in height. 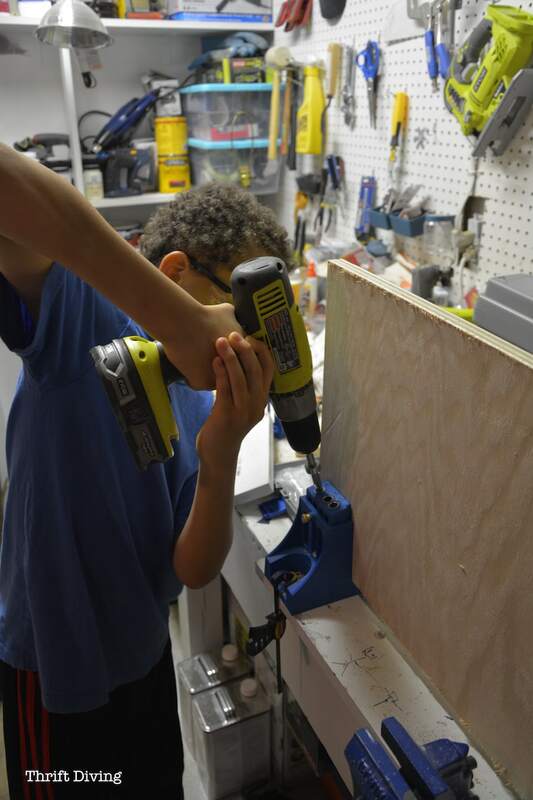 I enrolled the help of my 9-year-old to make pocket holes in the end and inside panels. (For the sake of time, I won’t get into details about pocket holes, but if you want more info on this, just email me!). 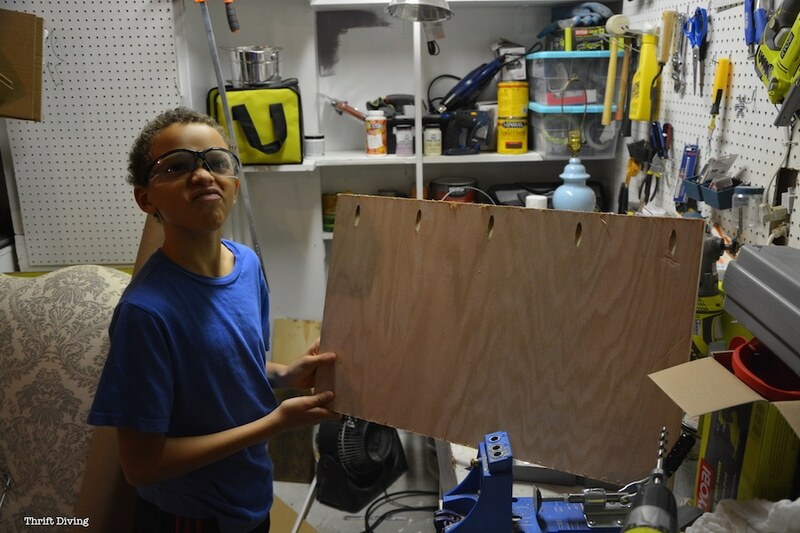 He was so proud of his work, but for the life of me, I couldn’t get him to take a picture without making a face. HA! 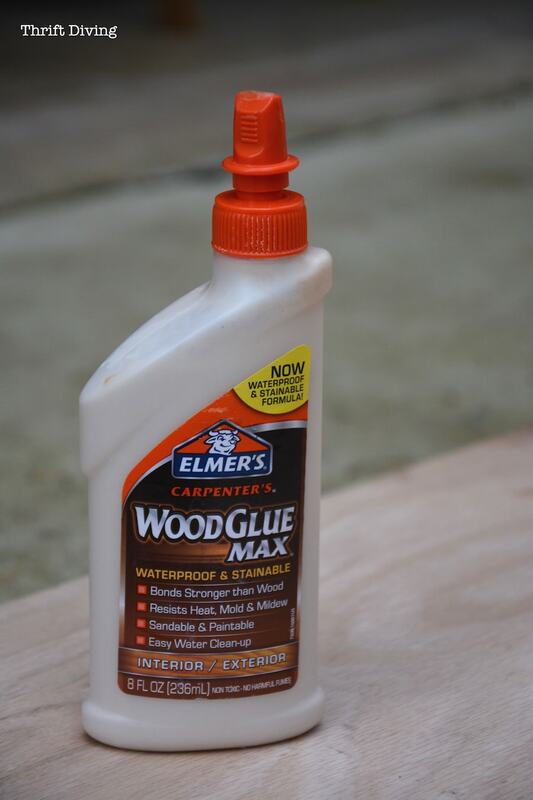 When I’m working with wood, I always use Elmer’s Wood Glue to glue before screwing! I’ll usually let it set a few minutes before trying to screw or nail boards together. 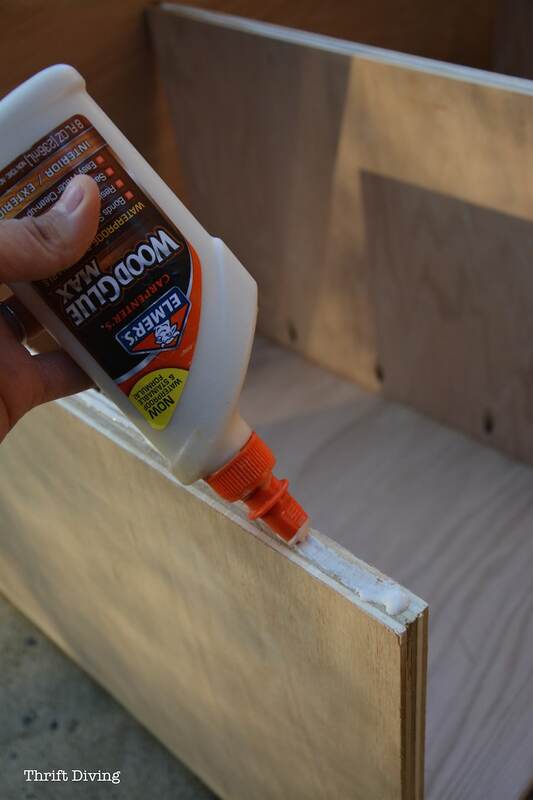 Not only does it help keep boards from getting shifty when trying to screw or nail them together, but it helps to create a stronger bond between the materials. Just put a bead of wood glue along the edge and hold in place with a clamp to let it set for a few minutes before screwing in. 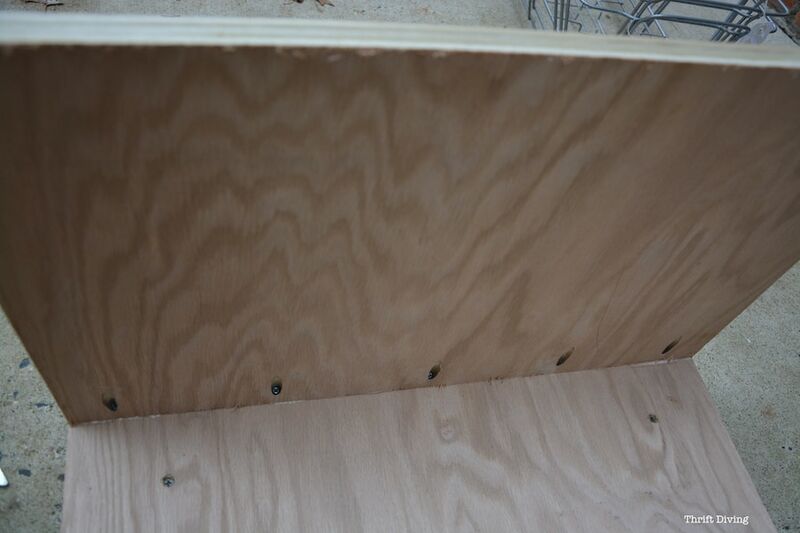 Here you see the ends are now glued in and pocket hole screws have been added, so those joints are suuuuuper tight! Just a little tip: it’s easy to make the sides lopsided. One of mine actually did turn out lopsided! HA! But if you use an empire square, you’re less likely to screw this up and get the sides as close to 90 degrees as possible. 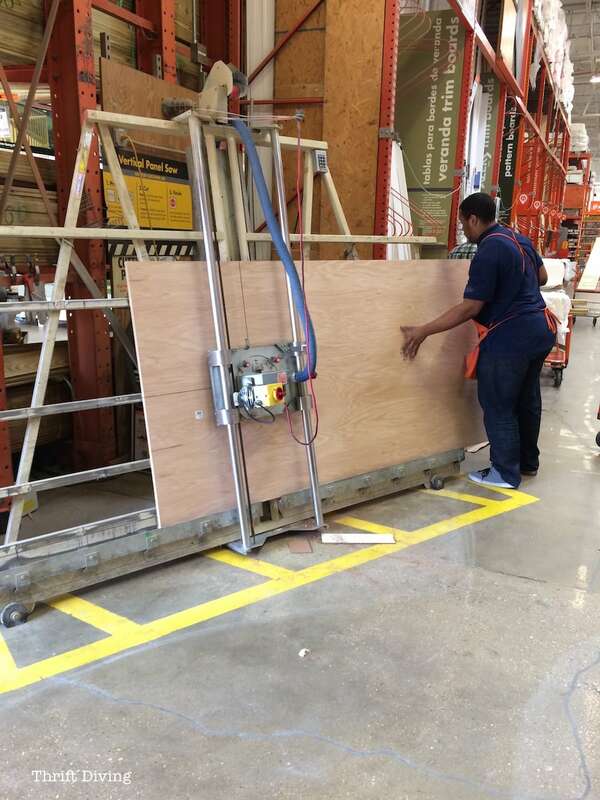 Now it’s time to add the top panel. 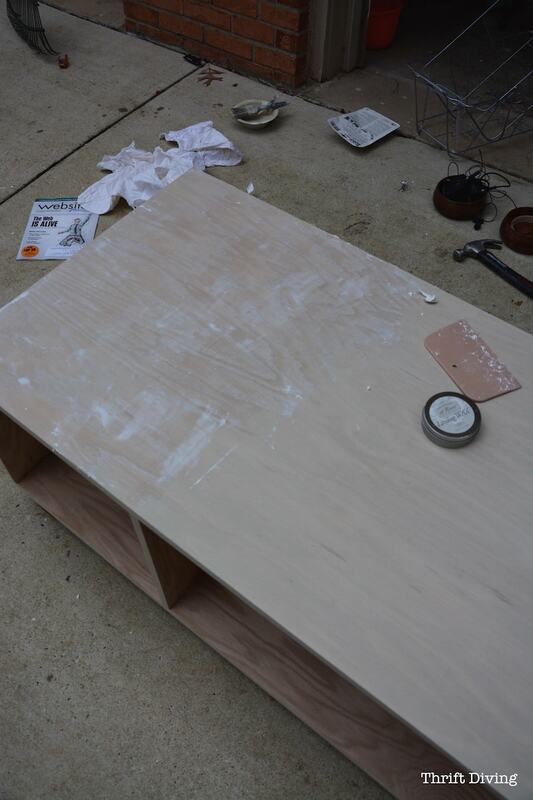 I didn’t have a good idea how I was going to get the top on, so I just decided that wood glue on the ends and inside pieces would work, then placed the top on, and nailed it down with my brad nailer with 2″ nails, but you could use a regular hammer and nails, too. STEP 6: Time For Hole Filling! 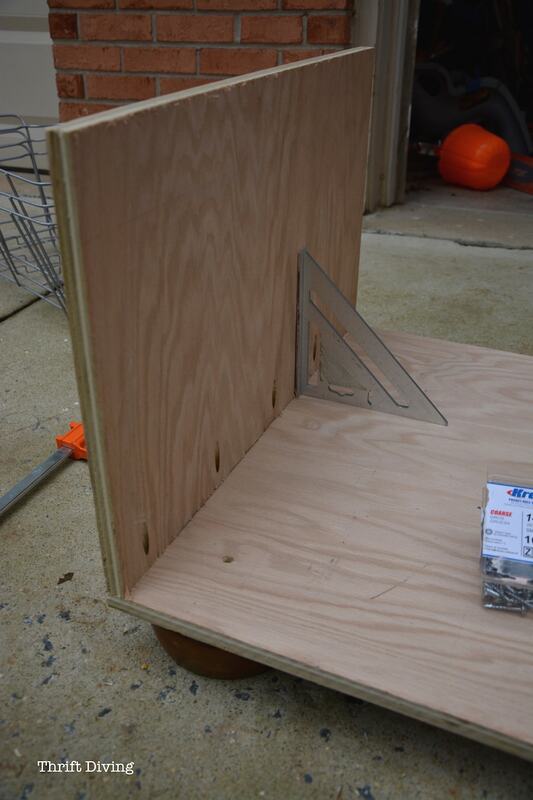 I made pocket holes (I use a Kreg Jig to make easy pocket holes with a simple drill) so I can’t leave these exposed. 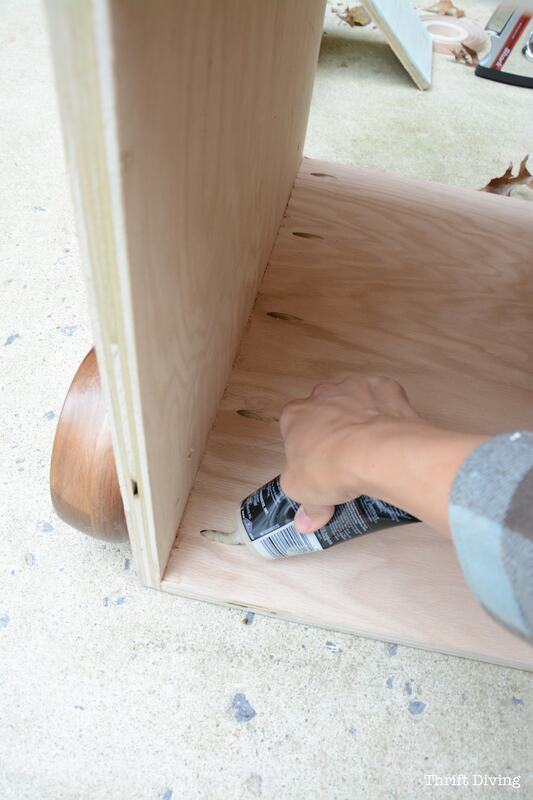 Even if you use small nails or a nailer, you’ve got to hide the holes. 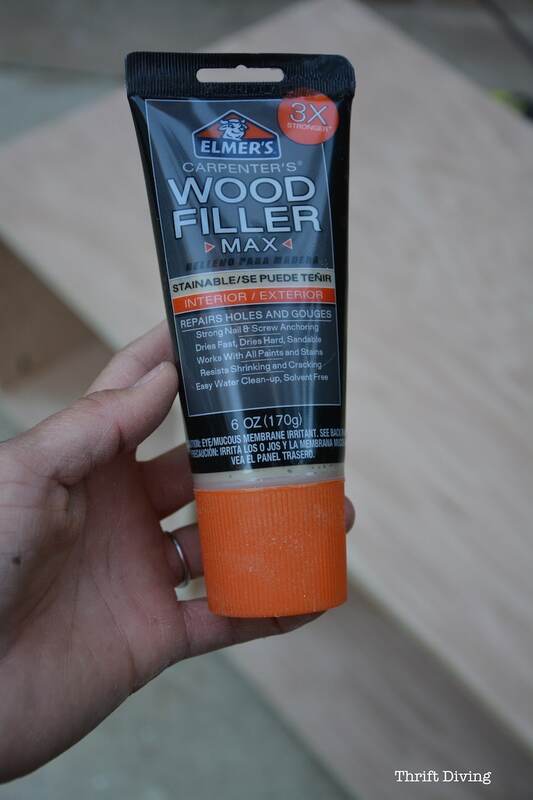 Elmer’s wood filler has always been my go-to for filling holes. It dries pretty quickly, and just sands smooth. 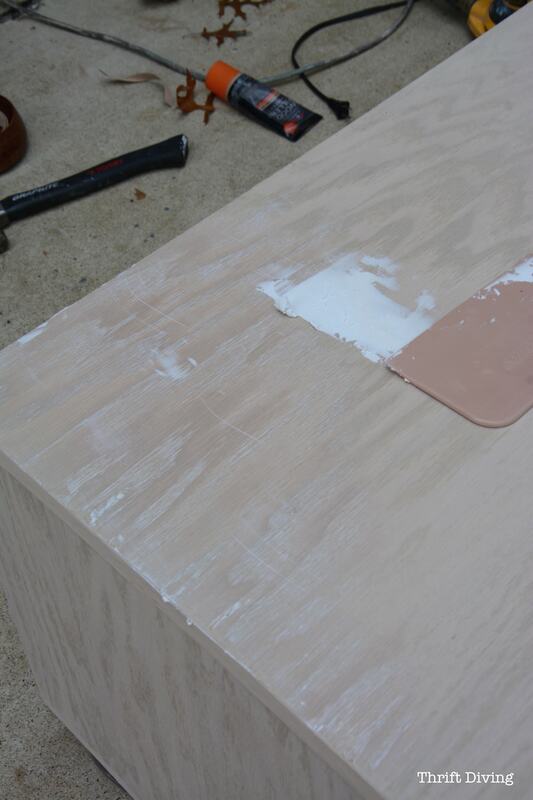 I filled each of the pocket holes and let it dry for a while before sanding. This stuff is the most magical invention for making a piece feel finished! 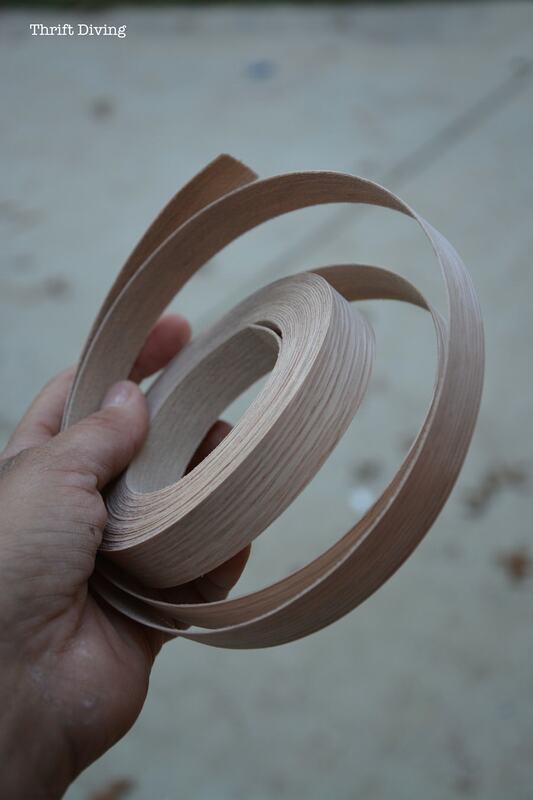 It’s a roll of wood veneer that you iron onto the edge of your project to finish off the raw edges of your cut wood. Yes, iron. I looked hysterical ironing my project in my driveway. HA! And don’t think I didn’t burn myself at least twice!! 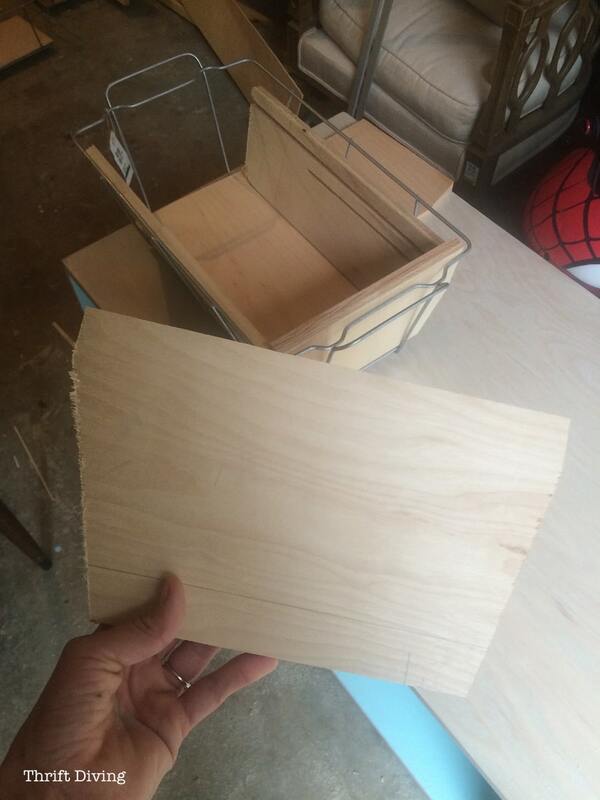 It’s 3/4″ wide, which was perfect for my 3/4″ thick oak plywood. Use a razor to shave off any overhang, though (I have a video tutorial coming for this later!). 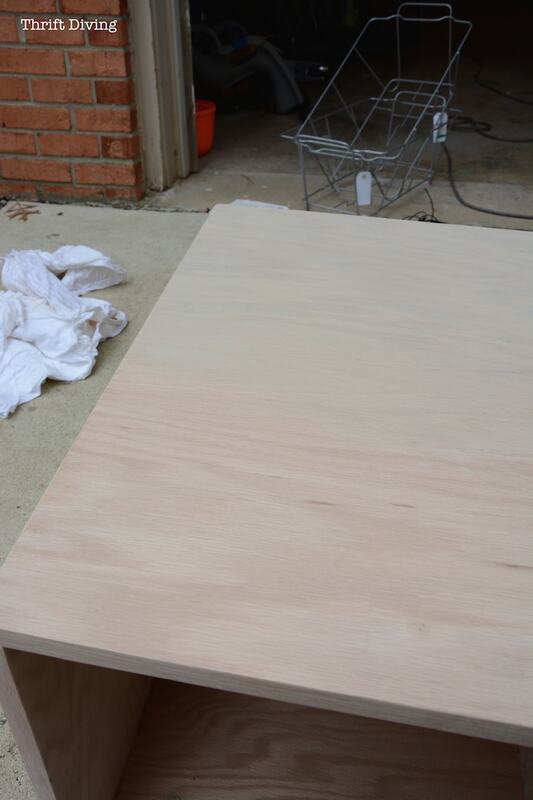 When the top was on and all the veneer edging was done, it looks like this! Now it was ready for paint! Remember I said in my recent posts about whether painted furniture is dead or not? 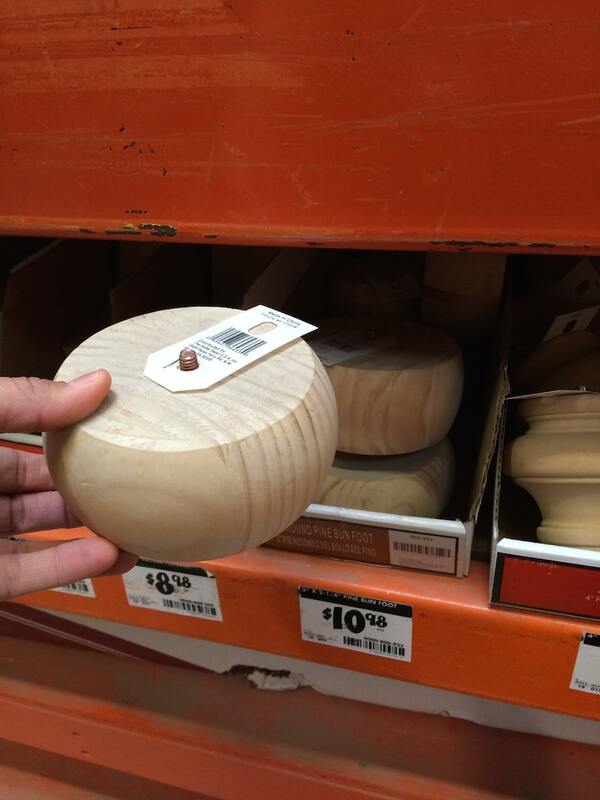 But I do love seeing the grain of wood. So I decided to give this piece a wash of chalk paint (I used Annie Sloan Country Grey) mixed with some water, then brushed it on, and wiped it off quickly. What’s amazing is that it still looks totally natural, but it’s still painted and has a different tone. :). You can see the difference here. It’s like wearing makeup when no one is thinking you’re wearing any!! ;). 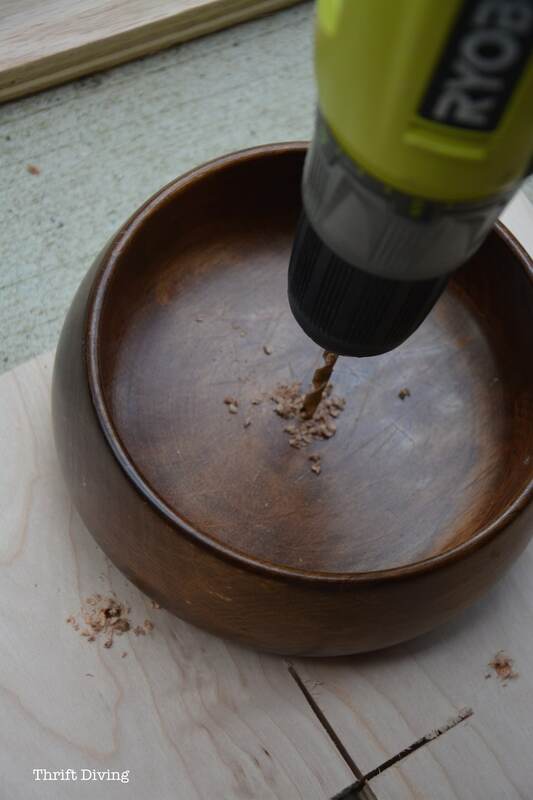 Then I used liming wax dragging it perpendicular to the grain of the oak, pushing the white wax into the grain, and allowing it to settle into the grain so it would make that grain “POP” more. Goodness–my back and arms ached later that night, as if I had done 100 push-ups! Who said DIYing isn’t a workout?! See the difference the liming wax made?? That white wax brings out the texture! LOVE that stuff! I wiped off the excess, allowed it to dry for a few minutes, and tried to buff it to a shine. It still looks a little spotty in some places, but I”ll figure it out! 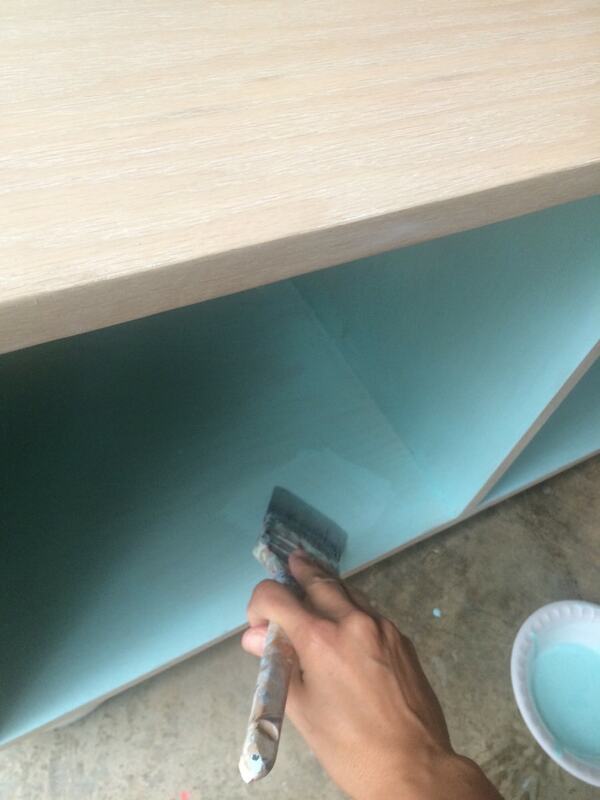 I absolutely love turquoise, so I chose that for the inside! I did two coats of a light wash of Amy Howard Tick Tock. Be sure to lightly sand and use regular clear wax. 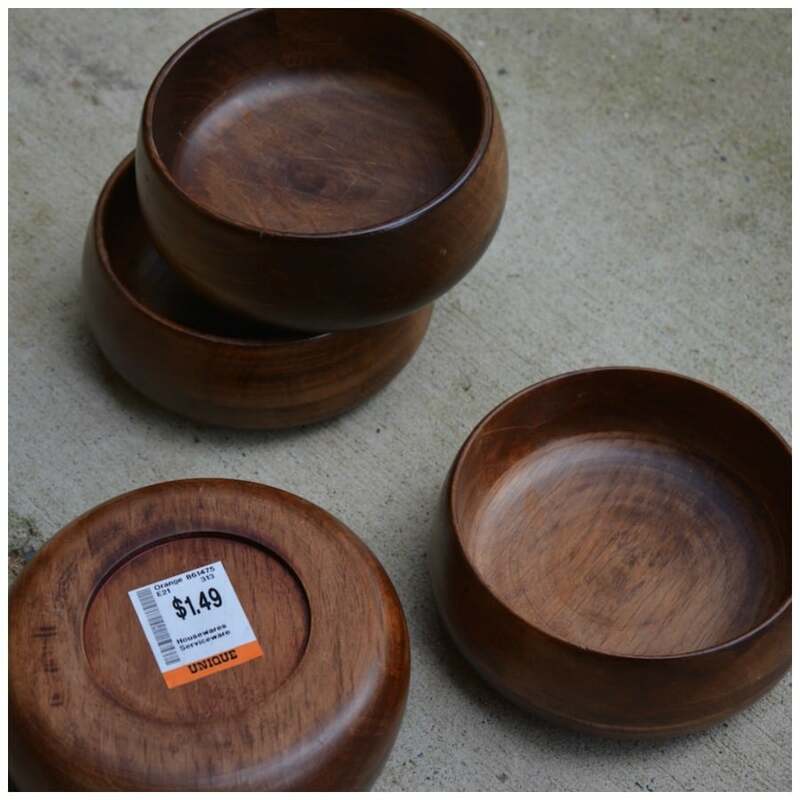 These wooden bowls from the thrift store are perfect for faux bun feet! 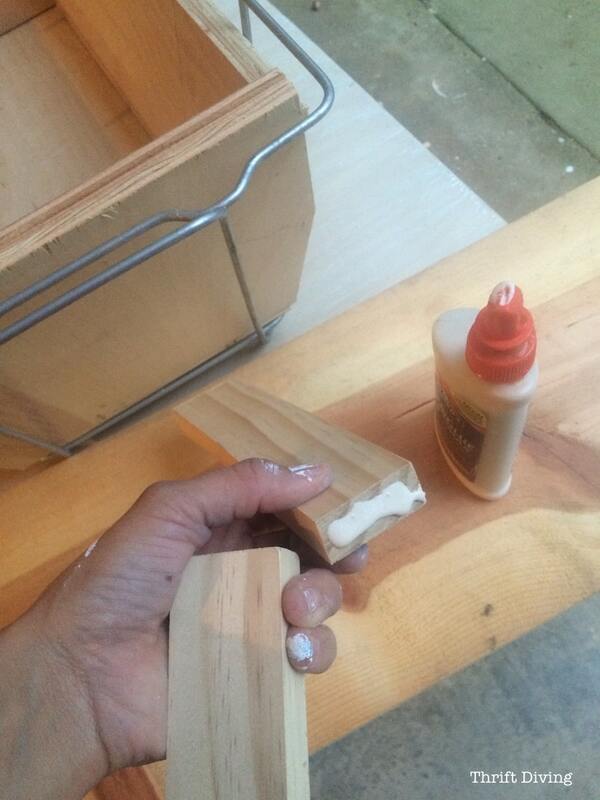 …then drill a hole in the base of your bench and add them to the bottom with screws and wing nuts! Whoever turns furniture over to know?? Nobody does (unless you’re selling it). For now, it will be our little secret…. LOL. I did prime and spray them with glossy spray paint after I test-fit them on the bottom. Okay, so this tutorial is already 1326 words….Did you even make it this far? 🙂 I hope so! If you’ve got some cheap baskets, use those. 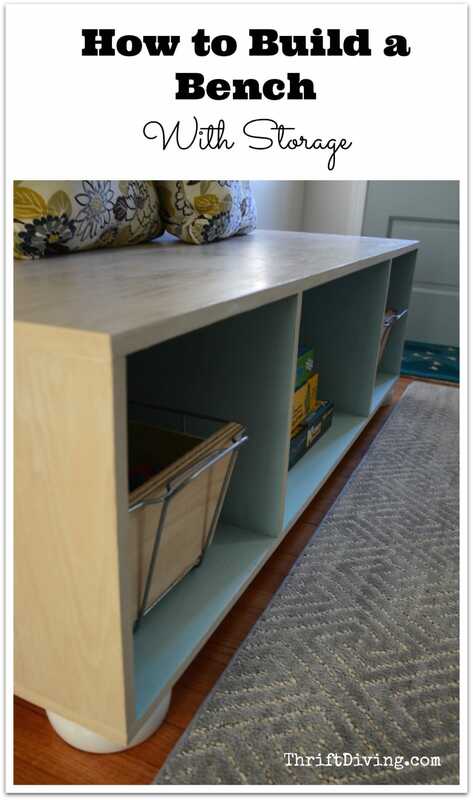 Or if you can DIY your own baskets like I did, glue and nail pieces of scrap wood together like I did from my garage, and line the old buffet warmers. The only thing left to do is to get some soft pads to stick to the bottom of the warmer baskets so they don’t scratch the paint inside. But Kojo thought they were pretty cool! They’re perfect for storing some of his toys! So what do you think?!? I know it seems very basic, but you’d be amazed how many steps are involved in the most simple projects!! And no one would ever know that my new bench storage has thrifted bowls for feet! HAHAHAH!!!!!! 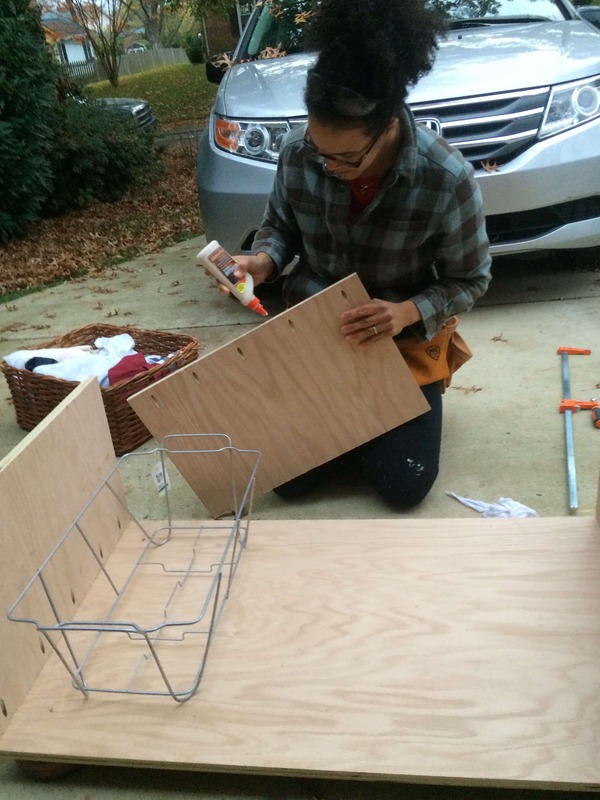 If you want more projects like this, and more, sign up for Elmers’ newsletter for inspiration! 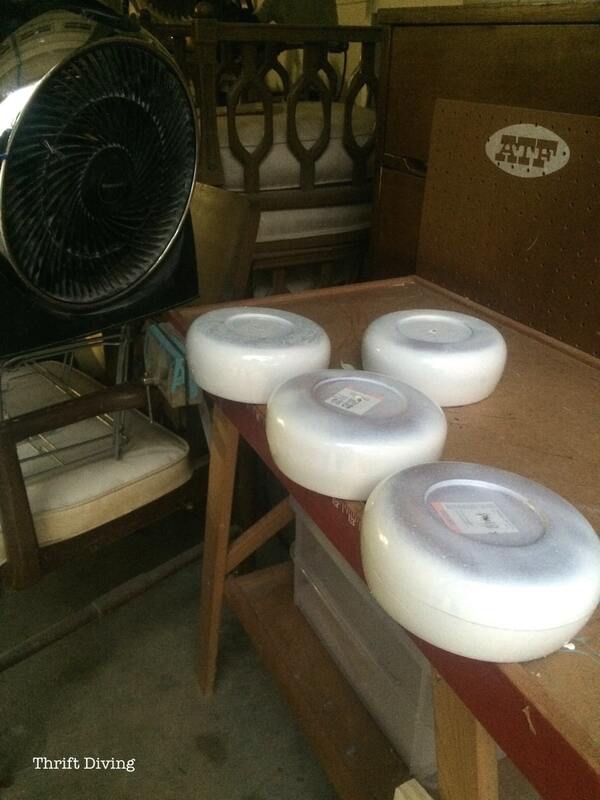 Okay, I cannot wait until spring to clean out my garage. It is so full of stuff that i have to pull stuff out in order to get in. Most of it are my mother’s belongings when she moved in with me from out of state. She is since deceased. My garage was used to entertain in the summer to eat crabs and as an place to escape the sun in summer. its a nice garage with beautiful high wood grain beams. 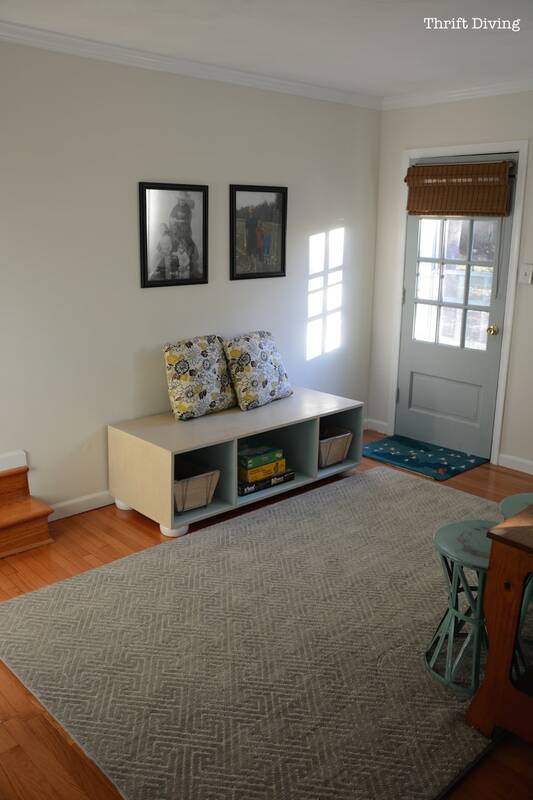 No cabinets or storage…..so I would like inexpensive ideas to make it functional and comfy (no chance the car will ever enter here ! ) . I will be taking some of your ideas into consideration this winter in planning for my garage makeover. Hope I remember to take before and after pictures ! You have given me a new sense of motivation instead of dread. THANKS SO MUCH ! awesome bench! 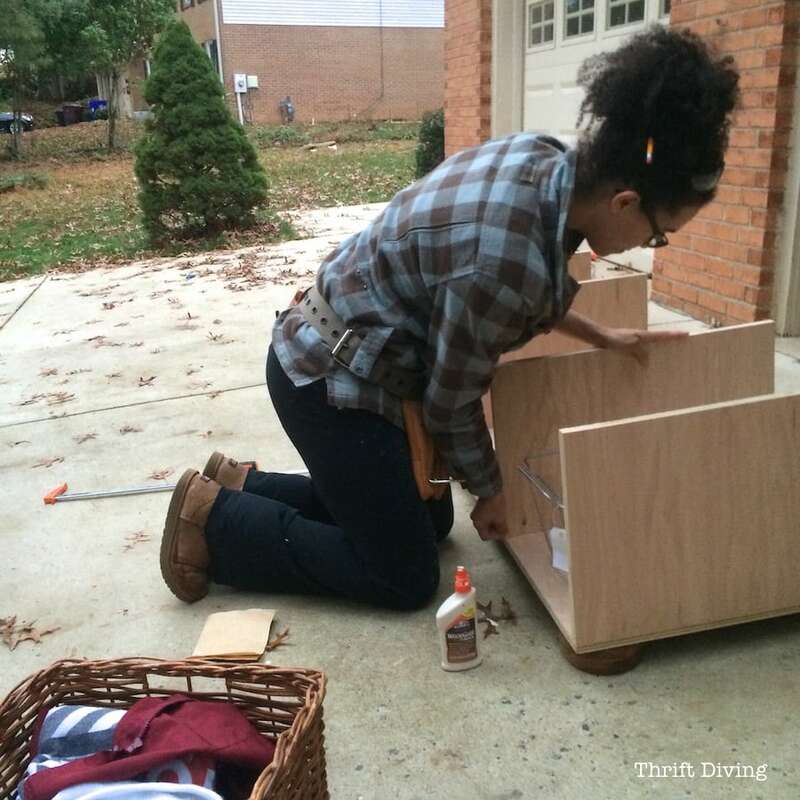 I love how you lined the baskets with wood, and the fake bun feet? awesome! 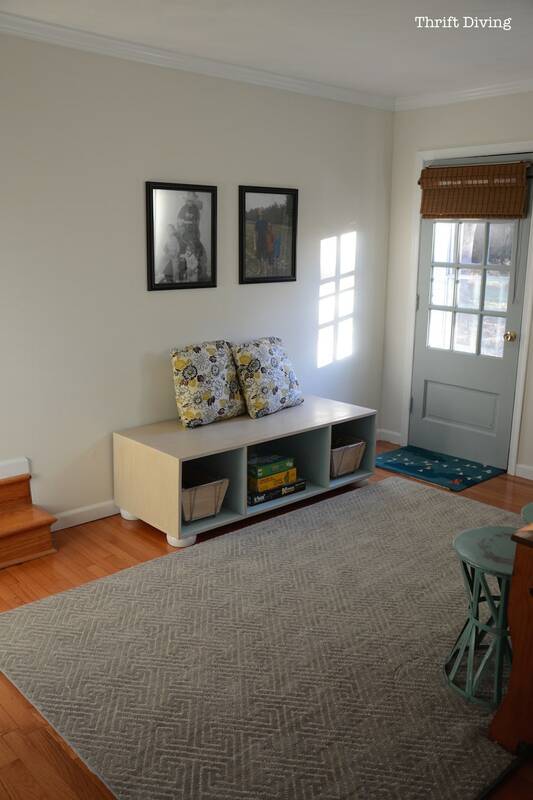 pinning this beautiful bench with storage! this build is the bomb! Great project Serena! I love that you painted the inside of the boxes instead of the outside. And your wire frames could also have some stiff fabric added instead of the wood…something patterned to offset that beautiful paint on the inside. I love this! Hi Serena! I have not written in a while but I too would love to know how you are enjoying your new job as an entrepreneur? I myself am loving the retired be my own boss life! I will be waiting for your post on that. Thanks girl!